Search Engine Optimisation (SEO) covers the whole range of services, tips and tools for managing your websites performance on the Search Engines (especially Google). Google Analytics is a fantastic reporting tool that can tell you a huge amount about the traffic that is coming to your website. It gives you comprehensive information on what locations your visitors are coming from (what countries, including indepth information about region / city), which pages they find most interestin and, very importantly, what they are typing into the search engines to find your website. This information can be invaluable for not only assessing how well your website is performing, but also what areas of your business people are not finding with their keyword search. If these keywords are important to your business you need to be ranking with them. 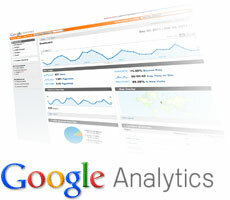 Scotland Web Designs installs Google Analytics for all of our clients. We do this to be able to help you to get the best performance out of your website, but also so that we can provide help and advice on the best ways of improving those results. A key conversion tool in getting those visitors from Google to purchase your goods or services, is the use of Google Adwords. It allows you to bid on sponsored links that you see at the top and right of Google's SERP's (Search Engine Results Pages). We have provided support for many clients over the years who have found this can be a cost-effective and efficient way of getting more targeted visitors to your website.